Race Winner: Dale Earnhardt Jr.
Dale Earnhardt Jr. won the 28th Annual Quicken Loans Race for Heroes 500, his 26th victory in 576 NASCAR Sprint Cup Series races. This is his third victory and 22nd top-10 finish in 2015. This is his third victory and 13th top-10 finish in 27 races at Phoenix International Raceway. Kevin Harvick (second) posted his 15th top-10 finish in 26 races at Phoenix International Raceway. It is his 27th top-10 finish in 2015. Joey Logano (third) posted his eighth top-10 finish in 14 races at Phoenix International Raceway. The Championship 4 drivers, in order of seed, are Kevin Harvick, Jeff Gordon, Kyle Busch and Martin Truex Jr. 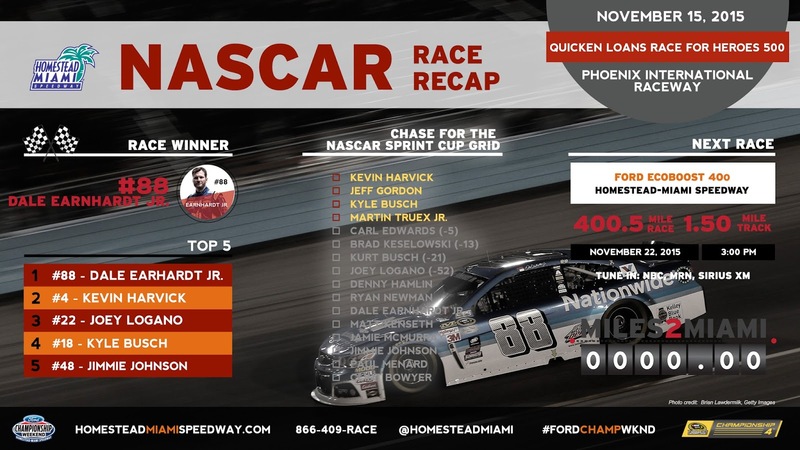 The Championship 4 drivers will compete for the NASCAR Sprint Cup Championship this Sunday, November 22 at the Ford EcoBoost 400 at Homestead-Miami Speedway. The race will begin at 3:00 p.m. ET and will be broadcast on NBC, SiriusXM NASCAR Radio, and locally on 100.3 FM Thunder Country.